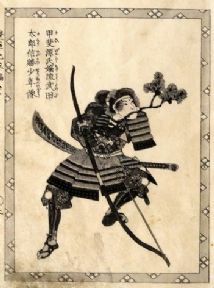 This vintage black and white Japanese poster shows a samurai warrior with a large bow. The warrior is also armed with a katana sword and has a branch of a bonsai tree in his mouth. The bonsai tree is very significant in samurai culture and represents a sense of naturalness which has been subtly accentuated by human intervention but which is not spoiled by stark evidence of human interaction.